8", 3-valve concealed tub and shower diverter. Brass underbody, acrylic handles, chrome spout, ABS shower head with chrome plated arm and flange, brass stem and bonnet, compression. Phoenix. Also see Parts breakdown illustration. 8" Tub & shower diverter. DuroPro underbody, chrome plated ABS shield, acrylic handles, compression. P801. Also see Parts breakdown illustration. 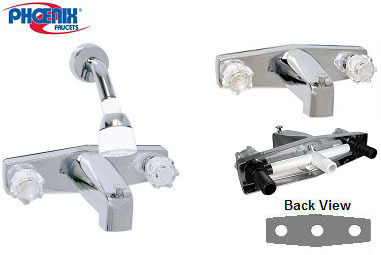 8" Tub & shower diverter, chrome plated ABS shield, Utopia acrylic handles. 8" centers. Washerless cartridge. Acrylic handles. Brass housings, ABS chrome plated spout, extra large acrylic handles, renewable seats, flexible hook-up line, Brass stem and bonnet, compression. Also see Parts breakdown illustration. Adjustable widespread design. Up to 22" centers. Non-metallic trim. Acrylic handles. Brass underbody, ABS chrome plated spout, extra large acrylic handles, renewable seats, Brass stem and bonnet, compression. Phoenix. Also see Parts breakdown illustration. 8" 3-Handle Deck-Mount Diverter w/One piece brass underbody. Brass underbody, ABS chrome plated spout, extra large acrylic handles, renewable seats, Fixed 8" hook-up. Brass stem and bonnet, compression. Hose for spout sold sep. Also see Parts breakdown illustration. 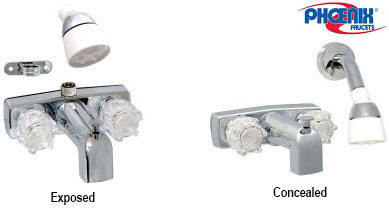 Traditional design and exceptional value come together in Premier’s Concord single-handle shower faucet. Its reliable, consistent performance provides you with peace of mind, while its appealing chrome finish enlivens your bath’s décor. The traditional showerhead provides a CEC-compliant flow rate of 1.8 GPM for more savings. It also includes an acrylic knob handle for simple temperature control, a diverter tub spout with a 1/2" FIP nose connection, and a reliable washerless cartridge. The faucet comes with Premier’s industry-leading Limited Lifetime Warranty. All-brass valve construction with metal trim. 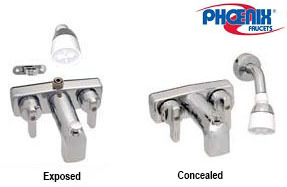 Single acrylic knob handle. Reliable washerless cartridge. Showerhead provides CEC-compliant flow rate of 1.8 GPM. 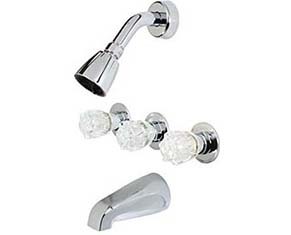 Single-function ABS showerhead. Includes diverter tub spout with 1/2" FIP nose connection. 1/2" FIP connections. For 2-hole installation with tub diverter control on the spout. 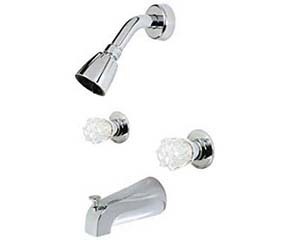 Set includes diverter spout, shower arm, flange and shower head. 8 in Centers. Chrome finish gives the shower classic style. 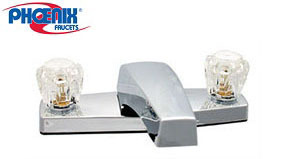 Clear acrylic hot and cold-water handles make the temperature easy to control. 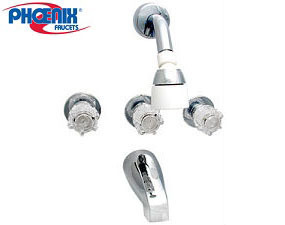 3-Hole installation with a center diverter control handle Set includes spout, shower arm, flange and showerhead. 8 in Centers. 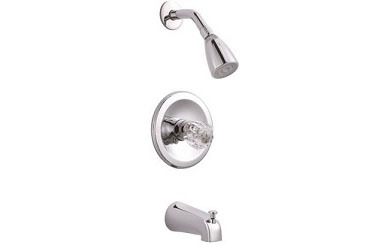 Chrome finish gives the shower classic style. 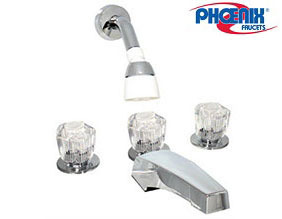 Clear acrylic hot and cold-water handles make the temperature easy to control.